Bayanihan (pronounced as bah - yah - nee - han) is a Filipino term taken from the word bayan, referring to a nation, town or community. The whole term bayanihan refers to a spirit of communal unity or effort to achieve a particular objective. This good custom is widespread in the Philippines, in fact many ethnolinguistic groups have their own term for "bayanihan". The Waray people of Leyte call it tikloswhile those in Samar call it pintakasi. The Ivatans of Batanes call it kapanyidungan. Other Tagalog people also call it bataris or bataresan. The origin of the term bayanihan can be traced from a common tradition in Philippine towns where community members volunteer to help a family move to a new place. The process involves literally carrying the house to its new location. This is done by putting bamboo poles forming a strong frame to lift the stilts from the ground and carrying the whole house with the men positioned at the ends of each pole. 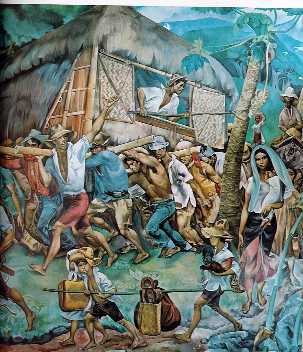 A mural by Filipino National Artist Carlos "Botong" Francisco and painting by Joselito E. Barcelona illustrates the whole process. The tradition also features a small fiesta hosted by the family to express gratitude to the volunteers. One of the first groups to use the term is a world acclaimed dance group (Bayanihan Dance Company) which travels different countries to perform the various traditional folk dances of the country with the objective of promoting Philippine culture. Today, the term bayanihan has evolved into many different meanings and incorporated as codenames to projects which depict the spirit of cooperative effort involving a community of members. An example of these projects is the Bayanihan Linux project which is a Filipino based desktop focused GNU/Linux distribution. Bayanihan has also been adopted as a term to refer to a local civil effort to resolve national issues.